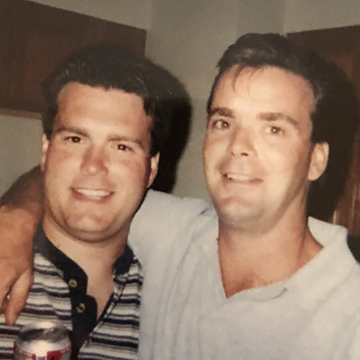 Mark and his brother Ben from the early 90’s. Lucas Irrigation was founded by Mark Lucas in 1993. The business was initially run by Mark and his brother from the back of a pickup truck servicing a handful of customers in the immediate area. Mark’s passion for irrigation and business, along with his commitment to providing quality workmanship and unsurpassed customer service quickly paid off. Word of mouth led to many referrals and his company began to grow. Since that time, the company has grown to servicing several thousand customers with a staff of employees who remain committed to the same values as the day the business was originally started. Although times have certainly changed and irrigation products have been improved immensely, providing unsurpassed customer service and quality products and workmanship is still Lucas Irrigation’s #1 goal. Our office staff is here to answer your calls and emails every week day. We are committed to assist you in servicing your watering needs. Lucas Irrigation installs and maintains irrigation systems as if they are our own, taking no shortcuts and cutting no corners. We know the investment you’re making when you choose to have an irrigation system installed and that’s why we insist on using only the best quality components. These components work better, last longer and remain reliable, maximizing your investment and providing you with the most efficient irrigation system. Mark strongly believes that these elements are what truly make Lucas Irrigation stand out from the competition. He prides himself on owning a company that is an industry leader and continues to strive on keeping customers 100% satisfied.